These pecan salted caramel brownies use a salted caramel fudge (the same as in Caramel Drambuie Pistachio Fudge) as a base component, rather than a melted butter-chocolate mix as with most brownie mixtures. Pecan halves add texture, and if you wish, you can add further decadence with caramel cubes that melt into the dough during baking. You’ll need a long ride to burn these off! Pre-heat oven to 160 °C (fan-forced). In a medium saucepan, melt butter over low heat. Add dark brown sugar, condensed milk and sea salt and mix to form a smooth batter. 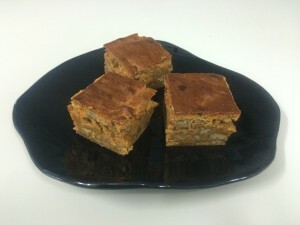 Turn heat to medium and cook mixture for 20 minutes, stirring constantly as it browns and thickens to form a fudge. The mixture should be only just bubbling during this time. Remove fudge from heat and let stand for 10 minutes, then add eggs beaten with vanilla essence and mix in evenly. Add wet mixture to plain flour in a large bowl and mix well, then add pecans. Bake in a greased, paper-lined square tin for 1 h or until a skewer inserted in the centre comes out clean. Let cool overnight before turning out and cutting into squares. If you want to add some extra contrast to this recipe, you can use additional cubes of caramel mixed into the batter. Using the first four ingredients, make an extra batch of caramel, pour into a square tin and let set in the refrigerator overnight. Turn out and cut into small cubes, dust with flour to prevent the pieces sticking together and store in the freezer until needed. You will only need about a third of this material for one batch of brownies. To use these pieces, prepare the brownie recipe as described above, but add the chilled caramel cubes into the brownie batter along with the pecans just before baking. Keeping the caramel pieces cold at this stage prevents them from dissolving into the general batter before baking, so they will maintain a distinct texture.